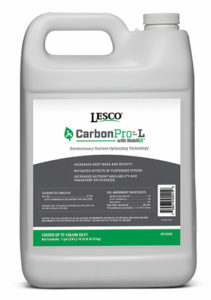 SiteOne Landscape Supply released LESCO CarbonPro-L with MobilEX, a liquid biological soil amendment. CarbonPro can be tank mixed with fertilizers, herbicides and insecticides when applied to turf and landscape plantings. The multisolution product deepens and strengthens roots; helps with stress recovery and prevention; improves greening; assists with seed establishment; prevents chlorosis, the yellow/loss of greening of turf; supports establishment of new turf through accelerated seed germination; and increases turf quality through remediation and restoration from saline soils and salt toxicity, according to the company. The product’s active ingredient formulation includes MobilEX nutrient transport technology, humic substances and kelp extract to harness the power of plant-microbe interactions and organic soil sciences. In tests, CarbonPro promoted 75 percent more root mass under 30 percent less nitrogen than positive and negative controls in tall fescue, SiteOne said. The product is available in 1-gallon, 2.5-gallon and 30-gallon quantities, with a 275-gallon option available upon request.